Her Majesty is The Queen of St Christopher and Nevis, often known as St Kitts and Nevis, and as such she has a unique relationship with these two mountainous islands in the Eastern Caribbean. The Queen receives regular updates via her Governor-General on day-to-day matters of Government on the islands. The Queen is a ‘constitutional Monarch’ in St Christopher and Nevis, meaning that she acts entirely on the advice of her Government ministers on the islands. She receives frequent communications from her ministers via her Private Secretaries and is kept well-informed on all key issues affecting the country and its people. I wish you all, Government and people alike, the best of good fortune for the future of these beautiful islands and of all those whose homes are in them. Her Majesty is represented in St Christopher and Nevis on a day-to-day basis by her personal representative there: the Governor-General. He or she is appointed by The Queen on the advice of the ministers of St Christopher and Nevis and is completely independent of the British Government. The Queen maintains direct contact with the Governor-General and delegates executive power to them in virtually every respect. They are appointed by The Queen on the recommendation of the Prime Minister of St Kitts and Nevis and perform the functions of the Monarch in her absence including Royal Assent for all bills and authorization of all government appointments. The Governor-General is completely independent of the British Government. Royal visits from The Queen and other members of the Royal Family have helped strengthen links between the island nation and its Monarchy. 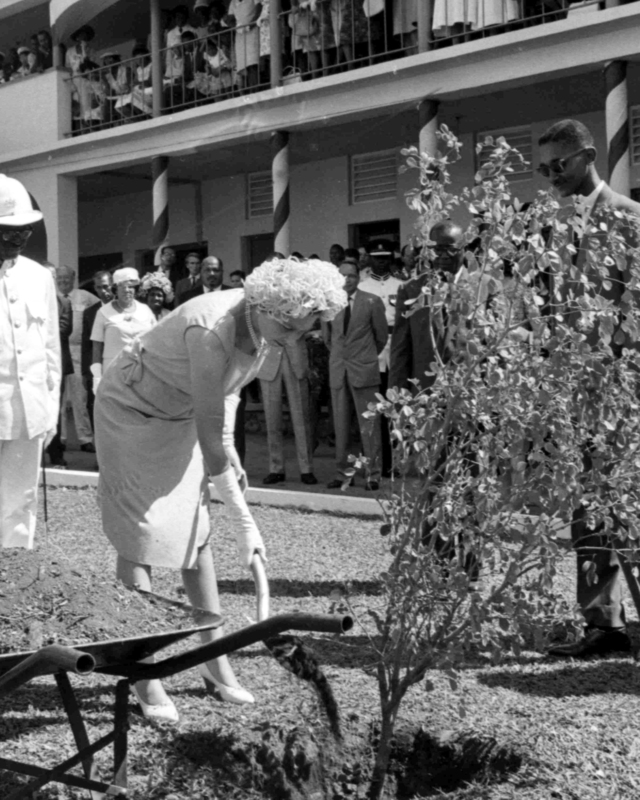 The Queen and The Duke of Edinburgh first visited St Kitts and Nevis in 1966 during which they attended an Investiture at Government House, with Her Majesty later planting a tree at Nevis Grammar School. Her Majesty and His Royal Highness visited again in 1985 during which a reception was held on board Her Majesty's Yacht Britannia. In 2012, to celebrate The Queen's Diamond Jubilee, The Earl and Countess of Wessex visited St Kitts and Nevis, and spent time at the Basseterre National Park, where they planted a tree to mark the occasion. Presented to The Queen and The Duke of Edinburgh by the Government and People of St Kitts and Nevis on their visit in October 1985, this cotton batik painting shows three humming birds sucking nectar from hibiscus flowers with palm leaves and foliage with an outline of the islands and flag of St. Kitts and Nevis. Prince Harry visited St Kitts and Nevis in 2016, during his Caribbean visit on behalf of The Queen. ​During his visit Prince Harry unveiled St Kitts and Nevis' dedication to The Queen's Commonwealth Canopy at Central Forest Reserve National Park. The Prince visited Lover's Beach, where the Nevis Turtle Group conservation initiative is dedicated to developing a Sea Turtle Conservation Programme on the island. Her Majesty presented Javon Liburd with a Queen's Young Leader award in Buckingham Palace in June 2015. Mr Liburd has assisted many young people in his community in St Kitts and Nevis through founding the J3H project,which also raises funds to give prizes to outstanding students from village schools. Meet Javon Liburd one of the #QueensYoungLeaders – Javon understands the importance of education and set up J3H, a project that helps young people in his community. J3H has raised funds to give prizes to outstanding students from village schools. In 2016 the second group of Queen's Young Leaders included Trevis Belle, with Javon one of the first to offer his congratulations.